If you have been working hard to stay in shape and get healthy this year, you don’t want to throw it all away during the holidays! It can be difficult to maintain a healthy lifestyle this time of year, but I’ve got a few easy tips to help you keep those pounds off! This post was sponsored by Luna Bar. However, these tips and my love for the new Gluten Free Luna Bar is all my own. Last year Andrew and I made a few changes to our diets to be healthier. This year, we both started going to the gym and made even more changes. I have felt so much better, and I definitely want to keep it up! It’s hard for me to eat healthy during the holidays. I don’t want to completely deprive myself of all of my favorite holiday treats. So in order to stay healthy, I came up with a plan of action so that I can indulge here and there, without setting myself back. 1. Choose a handful of days where you can indulge, and stay strong the other days. If you don’t want to miss out on the delicious food and desserts at a holiday party or during your family celebrations, plan ahead of time when you will have a “cheat day” and stay strong the rest of the time! Andrew and I are being extra conscious about making healthy dinners and not eating out as much. If your house is like mine, you probably have way too many holiday cookies and candies tempting you this time of year. 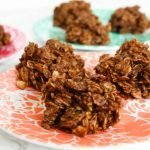 I’ve found that when I have healthy snacks in the house, it’s easier to avoid the sugary ones. 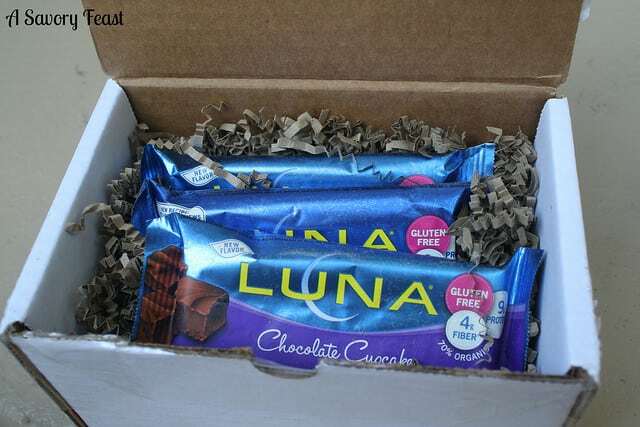 One of my go-to snacks is a delicious Luna Bar (which are now gluten free!). They are the perfect thing to eat before heading to the gym. They fuel my workout and hold me over until dinner time. I have a hard time finding a bar that tastes good and is good for me. But Luna Bar is one of my favorites! Those red Starbucks cups always tempt me with their delicious holiday drinks. And it can be hard to resist a cup of hot cocoa on a cold night, or a holiday drink at a party. Going back to tip #1, pick a couple days where you can indulge in these drinks, and stick to water the rest of the time. If you don’t like to drink plain water, you can try making infused water using fruits and vegetables! It’s good for you and makes it so much easier to drink enough water each day. 4. Don’t skip your workouts. This is so important! It can be easy to get busy during the holidays, but make working out a priority. Even if you can’t do as long of a workout as usual, try to do a little each day. You can also squeeze in extra calorie-burning activities wherever you can. Walk a little faster when you are doing your holiday shopping. Take the stairs more often. Dance to Christmas music! Every little bit helps. 5. Bring healthy dishes to holiday parties. When you attend a holiday party, see if you can bring an appetizer or side dish. Having at least one healthy dish to munch on will help you resist the heavier appetizers and that extra cookie. What are some of the ways that you stay on track during the holidays? These are all great ideas because it can be so hard this time of year. 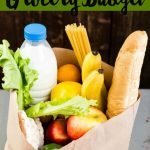 It really does help to plan ahead and already have the groceries on hand that are healthier to keep you from making wrong food choices. Planning ahead is key! If I don’t have healthy food to eat, I am way more likely to eat the bad stuff. Such great ideas, especially during this time of year! I’m really trying to focus on not skipping workouts especially when traveling because it’s so easy too! You can do it! You can find fun activities to do while traveling, such as hiking or ice skating. Thank you! They are really easy to put into action, too. Great tips! I’m having a hard time because I’m still recovering from surgery so I’m not being physically active at all (though I should get back into it slowly), and I’ve been indulging in so many holiday treats with no end in sight. BAD COMBO. But kinda good, too. Just trying to go easy on myself and slowly ease back into some healthier habits. These tips are exactly what I need to keep in mind! Putting these tips into practice should help. I hope your recovery goes smoothly! These are amazing tips! I’m having a hard time with keeping on track during this holiday season because of an injury, so these are very important for me. And those Luna bars are so good! Keeping a stash of Luna Bars will help for sure! Love this list! Drinking my calories is my worst holiday offense and it’s something I need to focus on getting better about. Thanks for the encouragement! I am terrible about it! I used to drink Starbucks all the time, but I cut way back to save money. It saves a lot of calories and sugar, too. Love this!! 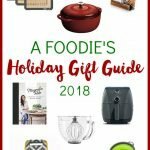 I ALWAYS struggle during the holidays so I’m going to definitely be using these tips. I am especially excited about bringing my own dishes and desserts so I at least have some inkling of say over how much sugar I scarf down. Thank you for this!! That tip is so helpful for me! I love to munch on appetizers at a party, and if there are some veggies or other healthy options, I’ll choose those. The Chocolate Cupcake flavor is so good! It’s like having dessert, so that helps with cravings, too. I always have snacks on hand like these bars for when I’m out for long periods of time doing Christmas shopping and whatnot! It definitely helps me get everything done without getting hangry, haha. It’s not pretty when I get hangry! The Luna Bars are great because they can go anywhere. Excellent tips! I try to have one small treat a day/indulge in cravings in a small way. For instance, if I’m craving a cookie I have in the pantry, I let myself have one so I don’t end up giving in late at night and eating 5 in one sitting! That’s smart! I should try that. Usually I am just thinking about sweets all day and then finally give in and have a big dessert. You definitely have a pass, then! Have a very Merry Christmas. Yes! The Chocolate Cupcake flavor is my favorite because it helps me curb the chocolate cravings. Some great tips! I definitely try going for lower calorie versions of my favorite holidays drinks! That’s a great idea! Sometimes you just have to indulge in a holiday drink, so it’s nice to be able to find healthier options. I’ve been hearing a lot about the Lemon Zest, and I think I need to try it! It sounds delicious. Love this list. I think a lot of people don’t realize how many calories they’re consuming in their beverages! Just plain water for me. That way I can eat more pie! I try to stick with water as much as possible, too. I saw the Starbuck’s nutrition facts once and it was scary! I love that feeling! I’ve been doing really good, so I don’t want to set myself back over the holidays. These are great tips! This time of year I tend to over do it and drink my calories, no doubt. I ned to be more aware of the nog! Usually I don’t have a problem with drinking my calories, except during the holidays. The egg nog, hot cocoa, Starbucks and other holiday drinks are just so good! Of course! I’m glad to be able to share. Wonderful tips! I definitely need to keep this in mind, I tend to over eat during the holidays. Need to schedule some time for working out! Being active helps in more ways than one! It’s also great because when you are regularly working out you are more likely to eat better, too. It is SO important not to let yourself stop working out during the holidays! It’s so hard to come back from it! I have a post about this coming up soon on my blog! Great post! I’m excited to see your post! I just got back into going to the gym. It’s been a few months and I feel so much better! Now I just need to be sure I stick with it over the holidays. Great tips! I need to follow these. They are so easy to follow, too! You will feel so much better, trust me. I have a tough time getting back to eating healthy after the holidays if I let myself go too much! But I’m glad that tactic works for you. My roommate is gluten free and she loves Luna Bars! I’ll have to try them – I am assuming they’re similar to Larabars? I love the not drinking your calories point, because that is where I really fail, especially this time of year! I have been trying to avoid gluten because it makes me gain weight faster. These Luna Bars are great and they are similar to Larabars. Delicious! My kids and I LOVE Luna bars!!! Great tips! I’m stocking up on them to be sure I stay away from the sugary treats as much as possible. I’m glad to hear you and your family love them, too. Oh gosh I’m, so useless. I eat really healthily, but it’s the lack of exercise that gets me! I really need to find a proper plan that works for me! It can be really tough to get into a routine! I started listening to audio books when I go to the gym, and it gets me more excited about going. They are so good! I’ve been trying to avoid gluten so it’s nice that these bars are gluten free. Those are such great tips. I especially love the one about thinking about your cheat days ahead of time and trying to stick to being super healthy the other days. It totally makes you not feel as guilty when you do indulge at the company Christmas party! Planning ahead is key! I don’t want to miss out on a few of my favorite treats and drinks, so I plan ahead. Good reminders! And I love Luna bars! Happily, I’ve been traveling for the past few weeks, so I haven’t been tempted by holiday parties too much. And then when I get home, I’ll just be happy to rest and drink soup… 😛 And looking forward to getting back to the gym (I’m a daily gym rat)… glad that you’re helping spread healthy awareness! I go to the gym almost every day, too. It helps me reset between work and my night. And I feel so much better when I go! I just learned that tip this year. It is so helpful! I need to remember these. Its so hard to stay on track during this time of year. If you plan ahead and follow a few simple tips like these, it doesn’t have to be so hard! Be sure to let yourself indulge a little, but stay strong the rest of the days. Oh man Luna bars are good. I try not to buy too many of the snack bars whether they claim to be healthy or not, but it’s so good to carry around if you’re out all day and need something to eat to tie you over. I always check ingredients on snack bars! These are better for you since they are gluten free, but still have the carbs and sugar. If you are working out, it’s the perfect fuel though. 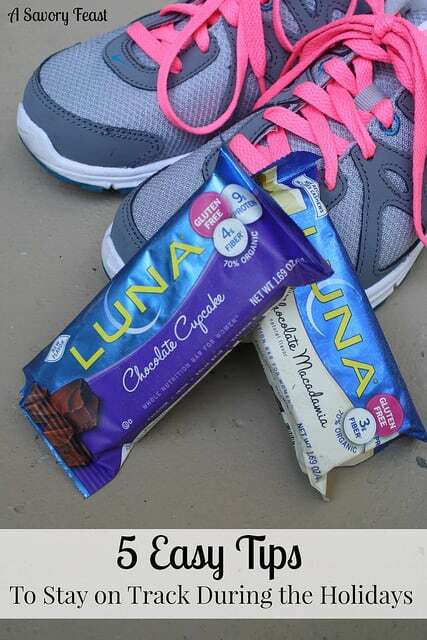 These are great tips and I’m dying to try the new GF version of the Luna bars! You will love them! Definitely try the Chocolate Cupcake flavor. These are great tips. Luna bars are yummy goodness. My friend was just telling me that she keeps Luna bars in her purse for when she’s doing a lot of running with the kids. That’s a great idea! It’s nice to have a better-for-you snack so you don’t resort to a fast food snack. I also try to limit portions, which helps me stay on track! That’s always been my go-to trick for maintaining weight. That’s a smart tip, too. 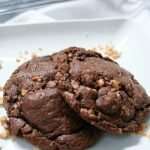 Sometimes I feel like I already had one cookie, so why not eat more? But it really does help to limit myself.